Question Time audiences often appear to be picked for their weird opinions, or abundant enthusiasm and anger. Like this guy from Inverness, who refuses to put his hand down throughout his entire rant. But one audience member stood out from the crowds last night for reasons other than his weird opinions on Brexit or Donald Trump. This audience was spotted by David Dimbleby, sat behind another person asking a question. He used this opportunity of being on camera to get his magic tricks a bit of exposure, choosing to go with the classic "I'm pulling my thumb off" routine. In a week when most of the topics were quite depressing and divisive, most audience members were pleased with a bit of magic to spice things up a bit. 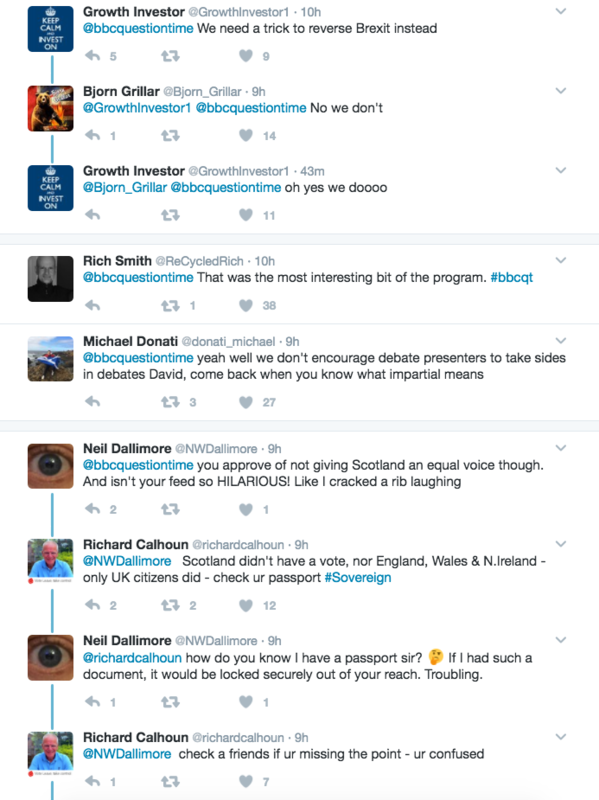 Unfortunately, as with everything on question time, it immediately turned political again and the fun got sucked out pretty fast again. The wizard-man's view on Brexit and Donald Trump remain unknown.